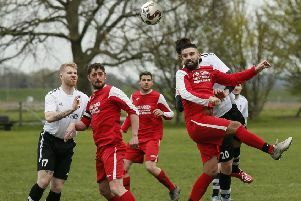 Kempston Rovers missed out on the Southern League Division One Central play-offs despite a fine 4-1 win over relegated Histon at Hillgrounds on Saturday. The Walnut Boys needed to win their match and hope that Egham lost or drew with Barton Rovers, but the Sarnies 2-0 triumph meant whatever Kempston did wouldn’t quite be good enough, as they fell short of fifth by a single point. Rovers took the lead in the sixth minute when Sam Johnson put Jake Newman through on goal and he bore down on goal to finish tidily. Kempston nearly gave away their advantage soon after, when Grant Fryer under-hit a back pass, leading to a scramble and an eventual clearance from Alex Stoyles. On the quarter-hour, a free-kick from Johnson was met with a bullet header from Robbie Goodman, but the Histon keeper tipped it over. Rovers did not have to wait much longer to double their lead, a curling shot from Ben Shepherd found the net via the far post on 20 minutes. Histon created a few half-chances towards the end of the half, but little to trouble Carl Knox in goal. Kempston extended their lead within 10 minutes of the restart, Newman heading powerfully into the net for his second of the game and seventh since joining the club in February. This seemed to spark Histon into life as they hit back two minutes later. Forward Tommy Wright brought down a cross and expertly flicked the ball past Knox to giving the visiting fans something to cheer in what has been a difficult season for them. With 15 minutes left, Rovers wrapped the game up as the superb Newman put the ball across goal for sub Ash Fuller to nod home his 17th of the season for a 4-1 lead. With news filtering through from Egham that they had doubled their lead over Barton, effectively ending Kempston’s play off dream, the match petered out as a spectacle. Rovers finished the season in a highly creditable sixth place as joint-manager Jimmy Stoyles said: “It’s been a great season. “Yes we’re disappointed, but at the start if you’d have offered us sixth place with 73 points, we’d have said yes. Rovers: Knox, Sundire, Simpson, Goodman, Stoyles, Fryer, Boland, Shepherd, Newman, Heneghan, Johnson. Subs: Guiney, Fuller, Ivy.